PUSH Weather alerts for the U.S. and 14 countries in E.U. eWeather HD is an elegant, easy-to-use and powerful forecast application. It combines ten day and hourly forecasts from two weather sources with a beautiful radar images and unique "weather wheel" interface. eWeather HD uses the latest technology to show the current temperature right on the home screen and notification center. eWeather HD will help you to plan your outdoor activities with the amazing accuracy. Just take a look at the Weather Clock and you’ll be informed when you should take an umbrella! eWeather HD also includes interactive weather maps, earthquake map and detailed severe weather maps. eWeather HD is the first app which uses two sources (located in the U.S. and E.U.) to bring you precise hourly forecasts as well as a full ten day forecast. Multi-provider system lets you choose the most accurate weather data for your location. eWeather HD uses latest technology to show you the current temperature (or feels like temperature) of any location right on your iPhone/iPad/iPod touch Home Screen! In addition to the temperature badge, you can set up the app to notify you of any changes in the weather as they happen, right in the home screen, Today screen or Notification Center. Barometer - a diagram showing the pressure changes during the past 24 hours. Now you always know the cause of headaches or migraines if it is linked with changes in the air pressure. When a dangerous pressure change has been detected the diagram will change the color. Another great feature is a weather alert system which includes push notifications and notification center support. This makes it even easier to keep tabs on what’s going on around you. * Ad-free. No limitations. No subscription fees. No hidden costs. Frequent updates. • a lots of improvements in graphics, performance and usability. • Geo-targeted severe-weather alerts and home screen badge. New eWeather HD uses your current location (even if the app is in background) to send you severe weather alerts for your physical location and (or) display temperature on home screen badge. • Background updates. eWeather HD refreshes weather data in background (when the app is closed) using smart algorithms so you'll get updated data when you open the app. It works even for "Follow me" locations. • Spotlight. Now all your cities, saved in list of favorites are accessible directly from Spotlight. • 3D-touch quick actions (using force touch on home screen). 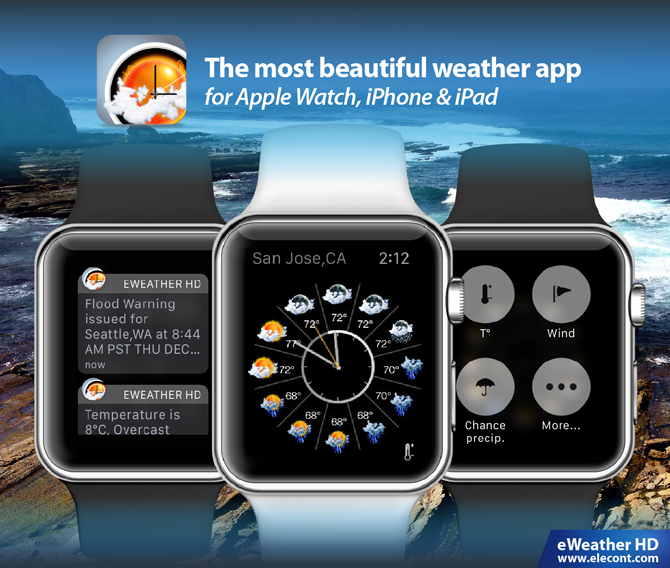 • Weather Glance for Apple Watch. The glance provides immediately relevant information about current weather conditions and weather forecast for the next 9 hours. Tap on the glance to open Apple Watch app. • Multiple locations in PUSH notifications for severe weather alerts (U.S. only). You may specify up to 5 different cities for PUSH alerting. • Ocean/sea buoy stations (see Alerts/Earthquakes/Tide/365 section). eWeather HD provides up to ten different values from over 700 stations across the world. The amount of reported data depends on buoy station. By default the app reports data from closest buoy, however you may override it and choose the best station for your location. • Improved tide predictions for over 4000 locations in the U.S.
• Support for multiple Apple Watches. • Customizable severe weather alerts for PUSH notifications. Enable or disable particular severe weather events from over 127 different types for PUSH notifications. • Severe weather alerts and notifications about changes in weather conditions are available as notifications on your Apple Watch. 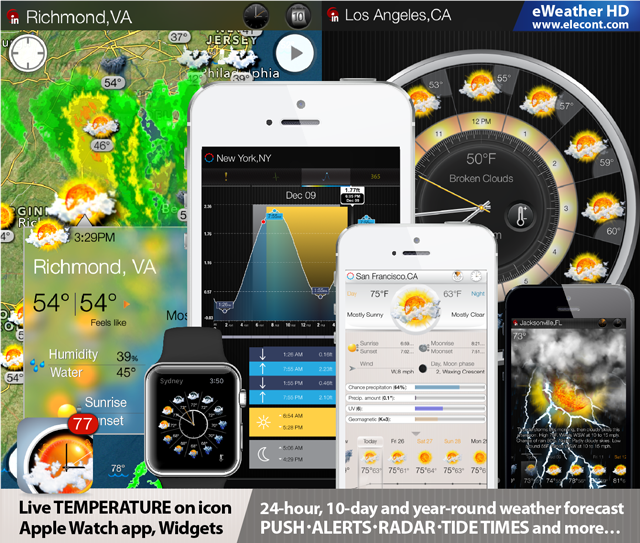 eWeather HD provides tidal predictions for more than 16,000 stations worldwide. • Hurricane tracking: The app display projected tracks of active storms. • Weather & sea temperatures for the next 365 days (long range forecast based on historical data). Swipe your finger around a circle to get data for specified date. • In addition to the alerts the app will display Additional notifications about upcoming events: Solstice, Equinox, Sun eclipse, Moon eclipse, Polar day, Polar night. • Full-featured, all-in-one, 64-bit weather app. Works on any device with iOS 5.1.1 and higher. • Two Reliable, Accurate Data Sources based in the U.S. and E.U. • Full coverage for the entire U.S.